Cryptotrader is an algorithmic trading platform for the most popular cryptocurrencies including bitcoin. The aim of the platform is to provide automated trading solutions powered by cloud-based cutting-edge technology for anyone interested in the cryptocurrency and bitcoin trading, be it an experienced trader or just someone who joined the crypto-world recently. Cryptotrader is an algorithmic trading bot platform for cryptocurrencies that allows you to automate your trading strategies via a flexible built-in scripting language. 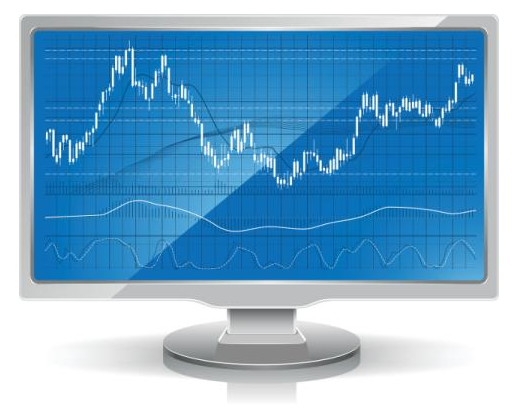 The site features a variety of trading bots which can be run automated in the cloud. You can choose fully automated trading bots for short-term profit which always riskier, or you can just choose the less risky trading bots primary focusing on long-term investments. The platform supports all the major bitcoin exchanges such as Bitstamp, Poloniex, OkCoin. There is no need for technical knowledge. Just need to register, find the best strategy for your investment, and you are ready to go. If you are more a technical person you can even create your own bot which is called Strategy on Cryptotrader. The backtesting tool allows you to see how your bot would perform in real world action without risking any real money. Cryptotrader.org has been on the market since 2013 which makes them one of the earliest and longest running trading platform still available today. Over the years the products and services have been evolving making sure the clients get most value for their money. Cryptotrader offers a cloud-based solution which requires no installation of any software, all bots no matter if it’s yours or you are just renting it, runs in the cloud. The strategy market section provides a variety of free and paid strategies, many of which are developed by professional traders. On the strategy detail page, you can see the basic information about how the bot works. The short description often includes details about recent trades made by the bot and general behavior you should expect when signing up for the trading bot. The source code is often protected as this way the developer of the strategy can make sure no one is copying his trading bot. However, there are also open source codes are available for those who would like to build new strategies. You can also get a list of markets where you can use a specific strategy on the same details pages. A couple of tests which shows how the bot has been performed in a given period in the past and you can also see if there are any live trades currently being done by the bot. Cryptotrader offers instant email alerts and even SMS notification helping you get notified how your bot is performing even when you are not at your computer. Multiple accounts available, ranging from accounts for smaller investors and institutional entities. Cryptotrader offers five different subscription plans, ranging from 0.002 BTC per month to 0.034 BTC per month. The “trading account equity limit” across all accounts is the total equity amount each trading bot can operate with. On lower plans, that amount is restricted while on higher plans, it’s unlimited. The smaller package is the Basic+ which costs 0.002 BTC per month. It offers a Backtesting option, email alert, one live trading bot. The Trading account equity limit is $1000. The next plan is the Regular, for 0.004 BTC per month, including three live trading bot having all the options as the Basic+. The limit for Regular is $5000. The Pro plan offers Backtesting option, email and sms alerts, up to five live trading bots for 0.008 BTC per month. Margin trading and short positions, access to multiple trading instruments with the maximum trading account equity limit of $20000. The VIP plan offers all the features Cryptotrader has with ten live trading bot running simultaneously all of which is from 0.014 BTC per month. The Premium bot for 0.034 BTC has all the features the VIP has but with 25 live trading bots. Using Cryptotrader doesn’t require you to download or install any software or plugins. It’s a completely cloud-based solution. Bots run in the scalable Cryptotrader VPS cloud. Cryptotrader runs an attractive affiliate program for its users. The referral system offers 10% after each new subscription referred through the link of the user. The revenue-share is applicable for all sales made by the new users. The developers of the bots receive a lucrative 70% share from the sales made through signing up to their trading bot. This makes Cryptotrader.org a truly profitable trading platform for those who can build successful trading strategies. Affiliate payments are sent out on a weekly basis on each Monday to the Bitcoin address provided. Some minimum programming experience is needed to use the Cryptotrader service if you want to build your own trading strategies. However, if you don’t have experience, or don’t want to spend time for creating your own trading strategies, then you can purchase trading strategies directly on the Cryptotrader online marketplace. At the marketplace, you’ll find strategies created by professional traders. Some of the strategies are available for free, while others are available are payable. 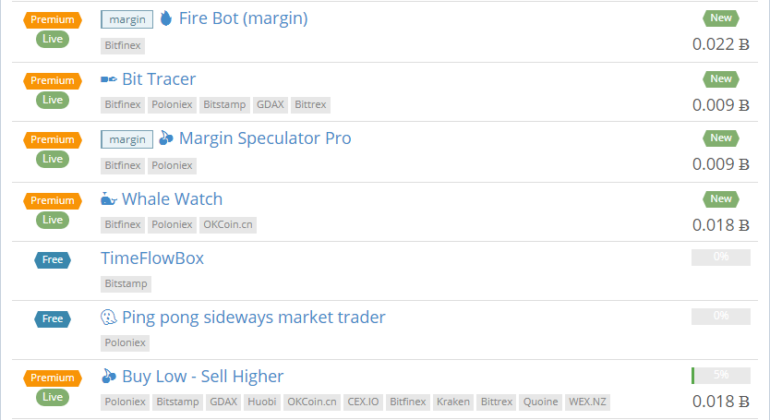 You can view all of these strategies from the front page of the official Cryptotrader website without signing up for an account. The right side of the table shows the cost and a popularity percentage. Typically, you’ll pay more for the higher-popularity strategies because they have a proven track record of achieving their investment goals in the past. Every strategy has a disclaimer that you should only use the bot for your own risk. Your capital is at stake after all. 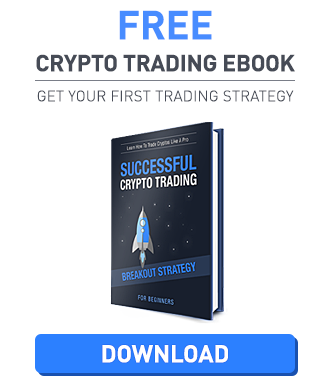 Cryptotrader.org is an automated trading platform where you can sign up for various trading strategies built by professional traders. You can also build your own trading bot based on the basis of other bots or develop something completely new. The available strategies to rent has a lot of details and backtesting information to be able to choose one that is closest to your market views. There are a couple of trading bots which are available for free, although the most popular one cost money. The subscription plans start from 0.002 BTC per month, and by upgrading to further plans more trading bots and more equity amount becomes available. The website is quite easy to use and straightforward, providing an enjoyable user experience. The site also runs an affiliate program with a 10% revenue share reward. Developers can get up to 70% sales shared after providing new strategies for automated bots on the marketplace.